Finished Floor Reusable Protection Film provides surface protection for floors, counters, or any finished surface. Light adhesive backing holds film in place, making it great for those high traffic areas that need extra protection. Durable and reusable, providing up to 100 days of protection. If any residue from the adhesive remains on the floor, simply use warm water to remove. Can you safely use this stair protection film on carpeted stairs? How does this product compare to stair pad protectors that you sell? Hi Betty, Thank you for your question. Yes, this is approved for carpeted stairs. However, we aren't quite sure what the oil tanks will do to the plastic. We are concerned they may rip the plastic if they are dragged up. Thank you, The Koffler team. Would it be possible to get a sample of the material mailed? I would like to get it in hand to determine durability before purchasing. Thanks, Marshall White White Builders Inc.
Is the adhesive safe for water based hardwood finishes? The product looks great but I've had issues with finishes coming off when I use blue painters tape. Long lasting Finished Floor Reusable Protection Film protects floors, counters, or any finished surface while staying in place without the use of tape. Easy to put down, installed over tile and even carpet. Been down for two weeks no problems, many trips up and down. Even used a dollie and four men with a crated cast iron 500lb+- spa down from the second floor, no problems wow. My stairs are tiled and also used in the bedroom on carpet(on carpet I also used blue tape for security, its holding). A must for any type of work. Thank you for your review. We very much appreciate your detailed explanation of your experience with our Floor and Stair Protection Film. Hopefully your experience will help others who may require similar applications. 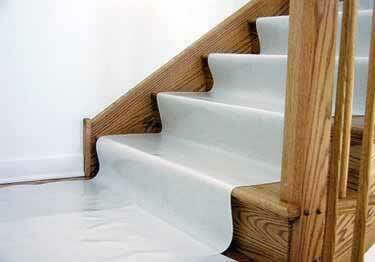 I've been looking for something to protect wood floors and stairs on remodel projects for years. This is exactly what I needed. Thank you for your review. You're right, this product is a great choice, as we have many construction companies that love this product for the exact same reasons. It save the new finished stairs and floor as we moved in the space. Thank you for your review. We really bride ourselves on quality products. As you've seen this product really holds up to heavy moving in traffic. There's nothing better for protecting stairs. The self adhesive material holds just enough to stairs to not slip, also does not pull up finish on stairs as other tape/floor protection. This floor protection film was exactly what I needed. It kept the surface safe from scratches during our move. I also liked the grip you got when walking on the surface. This product is great! Exactly as described and perfect for our needs. This is a great asset to our company and to our homeowners. Protective, easy to use, can be re used, protection is twofold - wetness and dents. Love it. Great for floors, stairs, and countertop protection. We love using this stuff when a job is getting close to done and we want to protect everything while we wrap up.